Bright and versatile: This bright projector lets you deliver dynamic presentations in a variety of lighting conditions with 3200 ANSI Lumens (max). Count on the outstanding brightness and picture quality of the 1430X Projector, whether you’re presenting to a conference room full of professionals or a classroom of students. Enjoy bright, versatile projection: Your presentations will appear bright and bold in a variety of lighting conditions with 3200 ANSI Lumens (max). Experience excellent image quality: Vibrant color, clear imagery and crisp text are yours with features such as XGA resolution (1024 x 768), a high contrast ratio of 2400:1 and BrilliantColor™ technology. 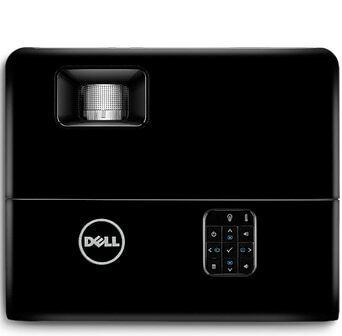 Present effectively and easily with the reliable DellTM 1430X Projector. It was designed specifically for ease of use and dependability. Dependable projection relies on long lamp life. That’s exactly what the 1430X Projector offers—up to 3,000 hours* in Normal Mode and up to 5,000 hours* in Eco-Mode. 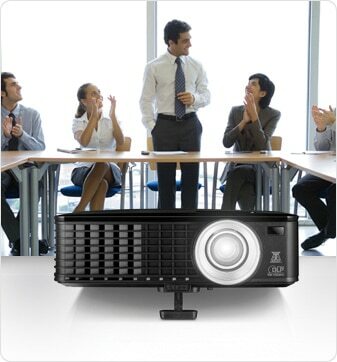 When it comes to planning for effective presentations day in and day out, count on a reliable projection solution and low total cost of ownership with the 1430X Projector. Streamlined maintenance: Top-load access makes changing the 1430X lamp easy, even while the projector is still attached to a ceiling mount (ceiling mount kit sold separately). The filter-free design helps ensure simple maintenance. Enduring value: The DellTM 1430X offers an impressive value for your organization with its reliability, versatility, ease-of-use, long lamp life and low total cost of ownership.